I've said it a few times....it's amazing how fast time flies. 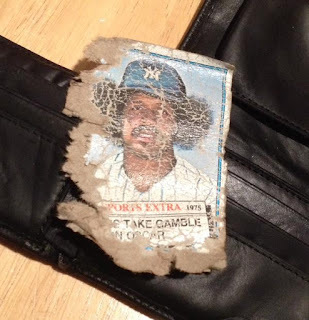 It's been almost four years now since my disastrous #WalletCard incident that left my favourite '76 Topps Traded piece of cardboard on the verge of completely falling apart. 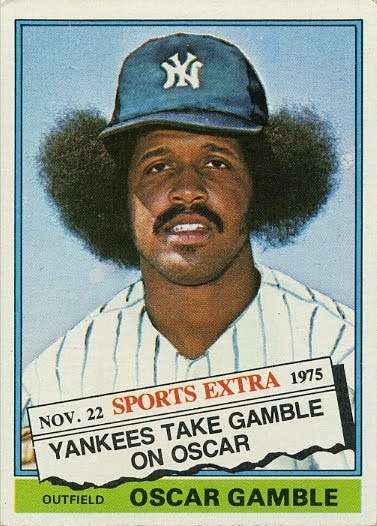 I still have the card though. Taped up and safely in the wallet. After all, it was a gift from a collector, blogger and just a good person and it's a constant reminder of getting out there and doing good things. That said.....I knew I'd need a new #WalletCard for the collection....and maybe even one for the wallet. 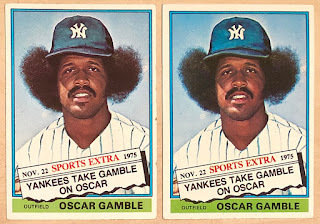 So I was gobsmacked when I saw a simple Twitter post selling not one, but two Oscar Gamble cards. The price? Two bucks - shipped....and he was sending from the States!! (albeit in a plain white envelope....which I was more than OK with). A little added aside to the story...he forgot to ship the card initially and felt bad. It had only been about a week or two and I chalked it up to the holiday season. Nonetheless he insisted on refunding me my money - and then still shipped said cards!! They showed up last week and I couldn't help but shake my head. What a perfect pair of permed hair. And it just works great as the one that has a slight ding on the side can now go straight into the wallet while the other (solid) offering can go into the player collection. Two 'fros, one stone. 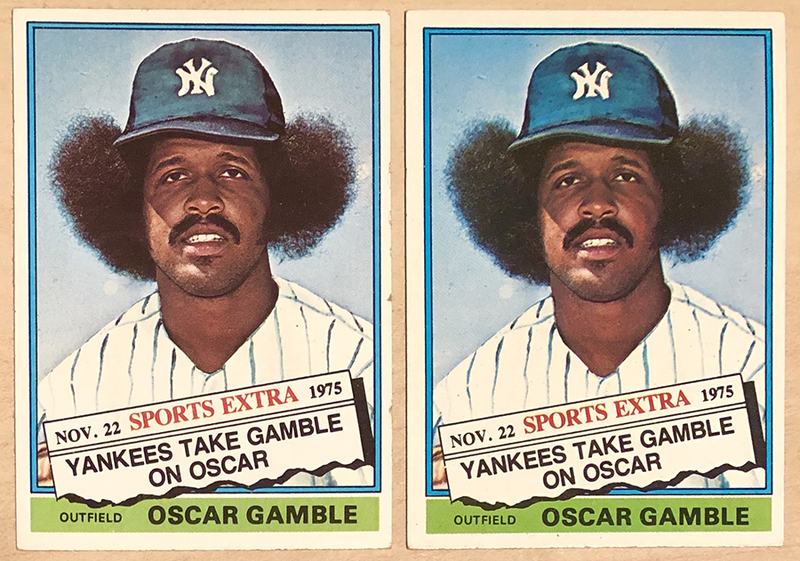 So a big thanks to OAC Cards Sales on Twitter for the great sale - and the kind gesture of basically giving me two Oscar Gamble cards. Oh.....and if you think I'm retiring the damaged copy......not on your life!! It's two Oscars in the wallet now. And a heck of a story. The original Gamble is awesome! Glad to hear you're not retiring it.